Yoga’s and Ayurveda’s recommendations about eating raw food seem to be opposed but only at first sight. Ayurveda generally does not recommend raw food for a long term diet but only for short term detoxification. That is because raw food is harder to digest and does not provide as much bulk nutrition as cooked food. Raw foods increase the air and ether elements in the body and mind, the attributes of Vata dosha. Cooked foods add water and earth elements (Kapha) and increase fire, the Pitta factor. This makes cooked foods better to build the body, but raw foods better for our prana and mind. Raw foods are rich in prana (life energy), which the yogi is seeking for cleansing of the nadis (channels) through increasing prana. The correct practice of yoga, particularly, Pranayama (breathing practices), increases digestive fire (Agni, see Concept of Agni), so one is able to digest raw food. With a higher internal heat and pranic fire the yogi can handle raw foods, extreme temperatures, little sleep and other physical imbalances that ordinarily cause disease. Ayurveda, however, is designed for ordinary people with regular digestion, which may not have the power to handle raw food for long periods of time. 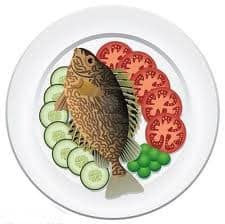 Yet most people can benefit from periodic raw food diets for detoxification purposes, particularly in late spring time, when nature itself is cleaning up (see detailed recommendations in Ayurveda and fasting). In our everyday diets we require about 10 to 20% of raw food, to get the proper amount of vitamins, minerals, and enzymes. Vata type has the least tolerance to raw food because of its weak digestion. Good raw fruit for Vata to take with meals are avocado, apricots, ripe berries (both sweet and sour), banana (ripe), cantaloupe, coconut, fresh dates and figs, all kinds of grapes, lemon, lime, ripe mango, melons, sweet oranges, papaya, pineapple, plums, soaked raisins, and prunes. The rule of thumb is that all fruits have to be fully ripe and be eaten at least 1 hour before a meal. Vata’s raw vegetable list is pretty short: cilantro, cucumber, green beans, and okra. Note that onions, cabbage, cauliflower, leeks, and spinach should be cooked to suit Vata’s delicate digestion. Pittas have a strong digestive fire but low tolerance for sour taste. Good fruits for them are ripe apple, avocado, sweet berries, cantaloupe, coconut, dates, figs, red grapes, lime, ripe mango, melons, sweet oranges, peas, pomegranate, raisins, prunes, and watermelon. All fruits have to be fully ripe and be eaten at least 1 hour before a meal. Raw vegetables good for Pitta are beet greens, bitter melon, cabbage, cauliflower, celery, cilantro, cucumber, dandelion greens, green beans, kale, lettuce, okra, parsnip, peas, spinach, and sprouts. Carrots and onions should be cooked in order not to disturb Pitta. Kapha type benefits from apples, apricots, berries, green bananas, cherries, cranberries, peaches, pears, persimmon, pineapple, pomegranate, prunes, and raisins. Beet greens, bitter melon, cabbage, carrot, cauliflower, celery, chilies, cilantro, dandelion greens, green beans, lettuce, okra, onion (raw and cooked), peas, radish, spinach (raw and cooked), turnips, and sprouts are good for Kapha in raw form. TODAY’S TIP: As you progress in following the Ayurvedic diet for your dosha you’ll notice that your body chooses more and more healthy pranic food and doesn’t crave junk food any more. Sir, I am suffering with tinnitus for the last some months. I am having bp, sugar and thyroid, for which I am taking medicine for the last many years. I am 75. I take raw bendhi (ladies fingers) water soaked in water overnight for the last one month. Fenugreek water boiled and taken. I take lunch at 10.30-11.00 and dinner at 7.00-7.39. In between I am taking bread, milk, fruits,juice of raw leaves with one tomato. I used to take karela (bitter gourd) +cucumbar+tomato juice. Now I stoppde it. For the last one days I am taking Sarivadi Vati of Baba Ramdev. But the tinnitus is not coming down. Moreover I am loss of hearing and memory loss. For constipation, I am taking triphala choornam 1/2 tsp at bed time with lukewarm water. Please help me with a suitable solution to the above problems. Wait for you respected reply. With best wishes, God Bless. My website is for general information only. Please see an Ayurvedic doctor in person. Hi sir, I have pitta body type and a very weak digestion. I can eat a lot of cooked food without much problem. I know carrots are good for glowing skin. It has always worked for me. As long as I take cooked carrots with milk I am fine. But the problem is with raw carrot juice. Whenever I go for it, it upsets my digestion in such a way that I need at least a month to get back to normal state. I always listen to what my body says. But I still feel that raw carrot juice works better for blood purification. And some of my friends who are pitta type just like me drink it everyday and they are just fine. Or may be I should solely fast on some raw carrot juice and avoid all other foods to let my stomach digest it. Waiting to hear from you. Thank you.